ROGERS PARK — Wheel gymnastics — a sport in which athletes vault, spin and run inside a stainless steel wheel wrapped in rubber — has found a special home in Rogers Park. Wheel Team USA has been practicing for months at Willye B. White Park, 1610 W. Howard St., in preparation for the nation's inaugural hosting of the Wheel Gymnastics World Championships. "It's crazy hard," said 15-year-old Prado Keme of competing against gymnasts from countries like Sweden, Germany and Japan. "It's going to be a good experience meeting new competitors and see what they can do." Prado said he hopes to learn a few tricks from his international rivals at the championship, set for Monday through Saturday at North Park University, 3225 W. Foster Ave. The competition is open to the public. It will be the first time the championships have been hosted outside of Europe since their inception 20 years ago. Prado's coach, Wolfgang Bientzle, is the man to thank for bringing it to Chicago. He's won eight world championships and has performed all over the world, including in Las Vegas for Cirque du Soleil. The sport was invented by a German blacksmith in 1925, who Bientzle said wanted to fulfill a childhood dream of rolling down a hill in a barrel. The sport's popularity boomed within 10 years, but its popularity waned during World War II. After a rebound in the '80s and after Bientzle finally settled in Chicago, Rogers Park has become the nation's unofficial wheel gymnastics capital. The Uptown resident partnered with the Chicago Park District to bring his team to the Howard Street park 2½ years ago. Since then, he's been training his team there and holding twice-a-week classes for the community. He also holds workshops there for some of the best wheel gymnasts, including members of Cirque du Soleil. "Which is funny, because you have trouble bringing the neighborhood here, but you have people coming from worldwide," he said, in his thick German accent. But some neighbors do participate, like a sprightly 70-year-old woman who's been taking Bientzle's classes. "She hates going to the gym," Bientzle said. "So here she is, rolling around ... once a week." Even though seniors can enjoy the wheel, it can also be dangerous. 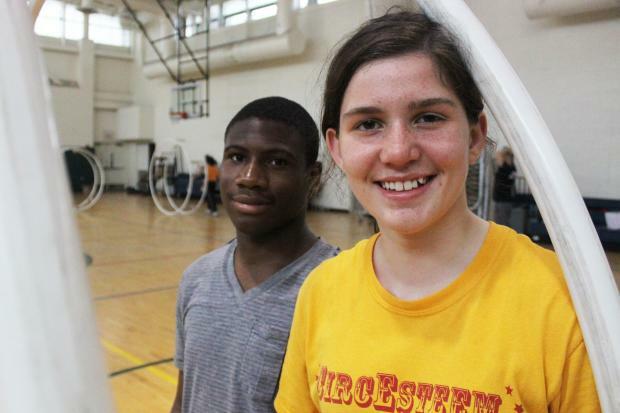 Gymnast Elsa Thompson, 15, traveled to Germany over spring break this year to train. On day two, she fell through her wheel and landed on her wrist, causing an injury that will keep her from doing at least one of her routines for the championship. Before that she missed a handhold and hit her face on a metal bar. "It is kind of a dangerous sport because you can get hurt easily," she said. "It's a big stainless steel wheel ... so." The Northside College Prep student and Edgewater resident said she's feeling nervous about competing against other gymnasts from countries that have more-developed wheel programs. But she hopes the hours she's put in four days a week during practices will give her a shot at winning a medal. For this year's championship, 25 American athletes — 11 from Chicago — qualified to compete, which turned out to be the biggest team out of the 25 nations competing. "We won't be picking up the most medals," said Bientzle, "but we have at least the biggest delegation and a strong showing in the competition."